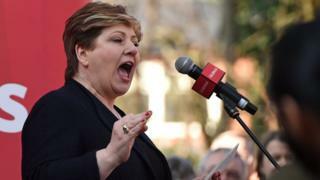 Shadow foreign secretary Emily Thornberry said Labour was "trying to pull the House of Commons together". Labour MPs are being urged to back a plan to keep the UK in a Norway-style relationship with the EU, as MPs debate Brexit's next steps.MPs will vote later to see if any proposals can win a majority - after failing to secure majorities last week. Under the Common Market 2.0 proposal, the UK would leave the EU, but retain freedom of movement and make contributions to the EU Budget.The Speaker has selected four motions, including one on a customs union.The SNP are also proposing to back the Common Market 2.0 motion, put forward by Tory MP Nick Boles. What is Common Market 2.0Theresa May tried to get MPs to back the withdrawal agreement element of her deal on Friday, but lost by 58 votes - having already failed twice to get support for her overall deal in Parliament. She now has until 12 April to either seek a longer extension to the deadline or decide to leave the EU without a deal. The cabinet is now split over whether to move to a softer deal that could mean including a customs union in her plan. It comes as the Tory Chief Whip criticised the government for not making it clear the UK would "inevitably" have to accept a closer relationship with the EU after Brexit.Julian Smith told a BBC documentary that after his party failed to get a majority in the 2017 election, "the government as a whole probably should have just been clearer on the consequences of that".In interviews for The Brexit Storm: Laura Kuenssberg's Inside Story, he also accused ministers of trying to undermine the prime minister.Mr Smith said he witnessed them "sitting around the cabinet table... trying to destabilise her [Mrs May]" and described their behaviour as the "worst example of ill-discipline in cabinet in British political history". The chief whip, Julian Smith: "The government should have been clearer on the consequences"
He did not choose motions calling for a unilateral exit to the backstop, to leave on 12 April without a deal, to hold a referendum in the case of no-deal or to rejoin the European Free Trade Association. You can read more about the proposals here. MPs are now debating the proposals until 20:00 BST, after which - as with the indicative votes last week - MPs will be given a piece of paper listing all the options and tick "yes" or "no" on as many as they want. The House will be suspended for 30 minutes to allow the votes to take place. It took two hours for the votes to be counted before, so the result could be around 22:00 BST. When MPs voted on proposals last week, all eight failed to win a majority in the Commons. However, the plan for a customs union - allowing UK businesses to move goods around the EU without tariffs, but stopping the UK striking independent trade deals - and a confirmatory referendum came the closest. Environment Secretary Michael Gove said agreeing a customs union would "compromise" pledges the party made in their 2017 manifesto, while Defence Secretary Gavin Williamson said ministers were "determined" to avoid that happening.Meanwhile, Tory MP Huw Merriman has written to around 200 of his colleagues who have voted in favour of Mrs May's deal, appealing for them to back the confirmatory referendum motion to prevent the customs union option succeeding. He said: "It is the only option which keeps the [PM's] deal alive and is not contingent on more EU negotiations". Digital Minister Margot James also told BBC Two's Politics Live that she thinking about changing her mind to back a confirmatory referendum. » Brexit: What is Common Market 2.0?